The February 3, 1923 magnitude 8.3 Mw earthquake off the east coast of Kamchatka, Russia, generated an 8-meter tsunami that caused damage in Kamchatka and in Hawaii. It was also observed in Japan and California. NOAA image. View larger map. Most of Earth's seismic energy is released along the subduction zones and transform faults that rim the Pacific Ocean. Magnitude 7, 8 and 9 earthquakes are not uncommon in these areas. Subduction zone earthquakes of these magnitudes are the most likely to produce a tsunami. 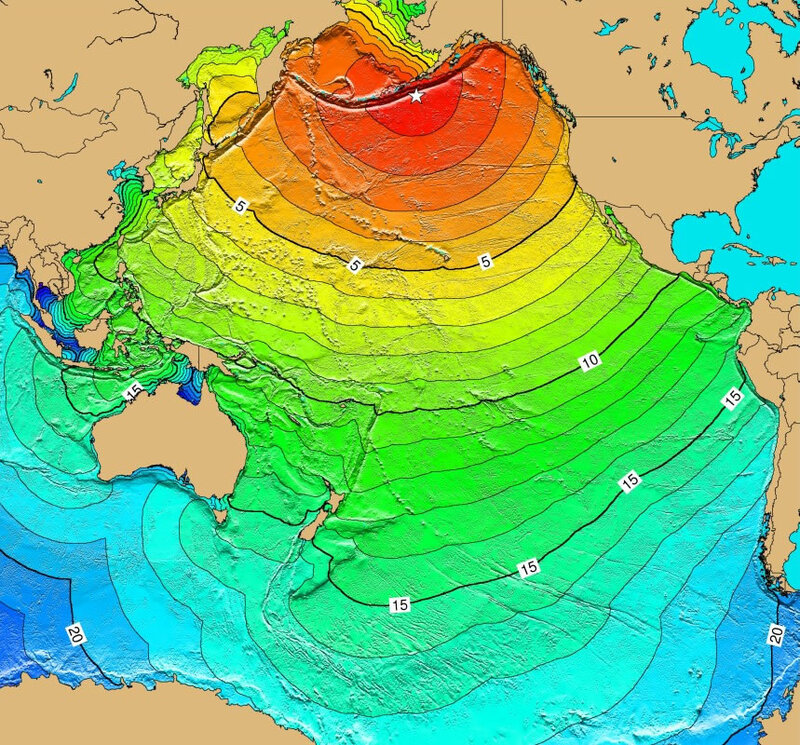 Since 1900 a number of deadly tsunamis have killed thousands of people around the Pacific Ocean. An earthquake in Chile can produce a tsunami that is capable of crossing the Pacific Ocean and over twenty hours later killing people in Japan. 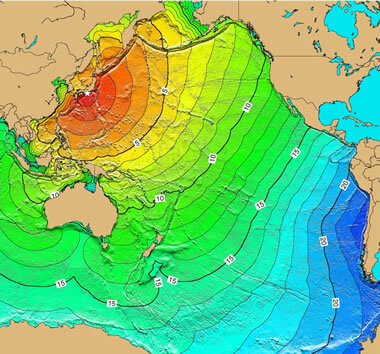 Each of the images on this page is a travel time map for a tsunami generated by a specific earthquake. 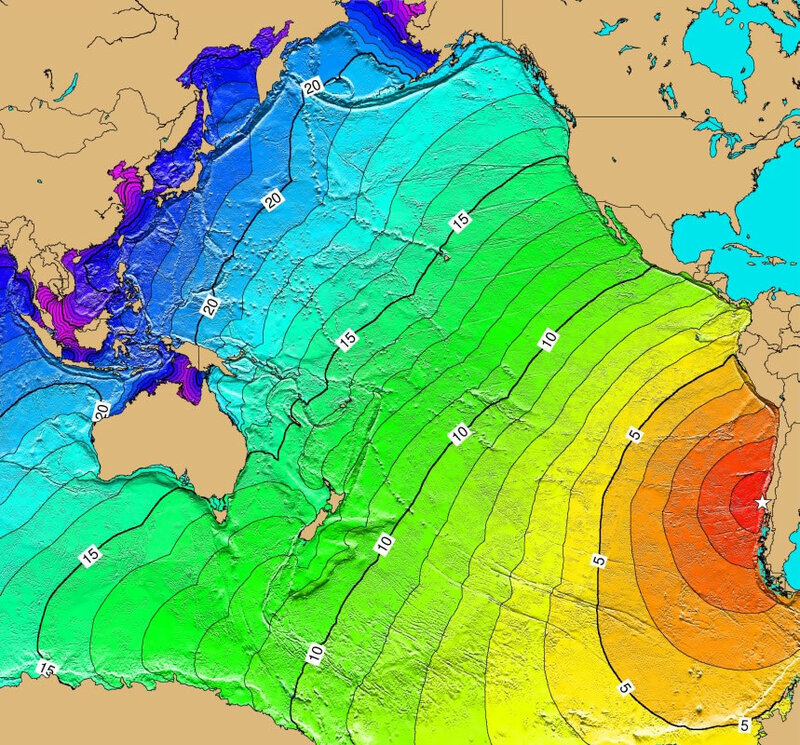 They show that Alaska, Japan and Chile are common sources of tsunami-generating earthquakes. They also show that Hawaii is in a vulnerable location because a large tsnuami generated almost anywhere around the rim of the Pacific will arrive there in five to fifteen hours. The April 1, 1946 Pacific-wide tsunami was caused by a magnitude 7.3 Ms earthquake that occurred south of Unimak Island, Alaska. Hawaii experienced the worst damage, with 159 deaths (96 at Hilo) and $26 million in property loss. Total property damage in Alaska was $250,000 while California experienced one death and $10,000 damage from the tsunami. These events led to the development of tsunami travel time charts for the Pacific and the Pacific Tsunami Warning Service. NOAA image. View larger map. 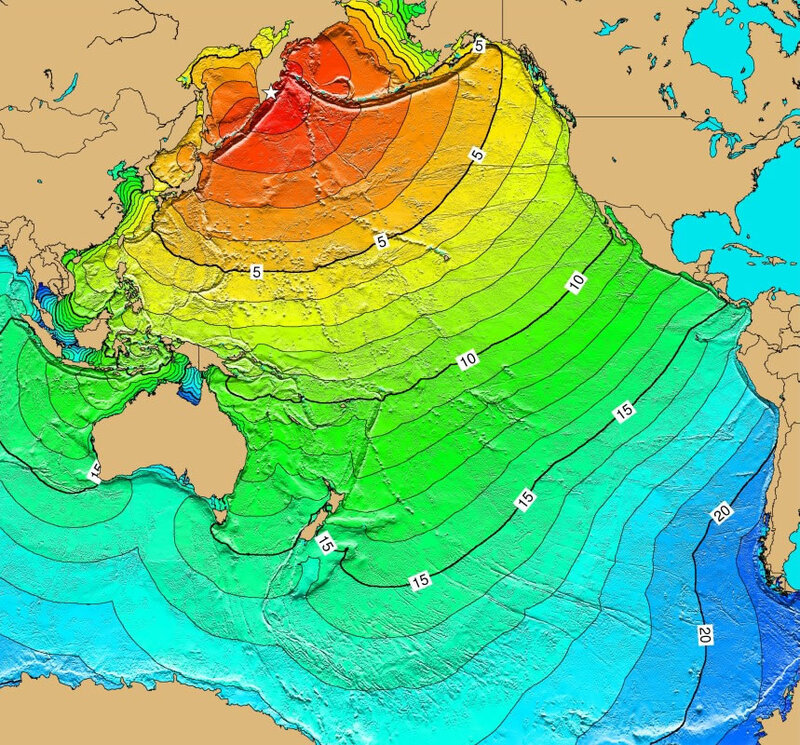 The 1944 Pacific-wide tsunami was caused by a magnitude 8.1 Mw earthquake that occurred off the southeast coast of Kii Peninsula, Japan. The earthquake and resulting tsunami caused great destruction and loss of life. About 998 people were killed, 2135 people were seriously injured, 26,135 homes were totally destroyed, 46,950 homes were partially destroyed, and 3,059 homes were washed away. The tsunami was observed on tide gauges in the Hawaiian and Aleutian Islands. NOAA image. View larger map. 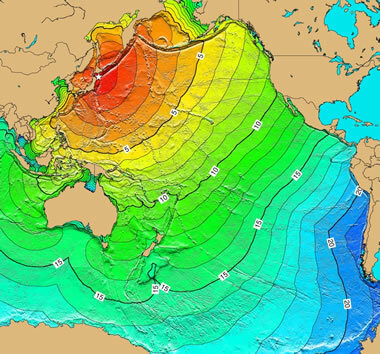 The magnitude 8.1 Mw earthquake and tsunami on March 4, 1952 off the coast of Hokkaido, Japan, did major damage in Japan. 815 homes were completely destroyed, 1,324 were partially destroyed, 6,395 were slightly damaged, 14 were burned, 91 were washed away, 328 homes and 1,621 non-residential buildings were flooded. Many ships were destroyed, and roads and railway lines were damaged. Twenty-eight people died, 5 people were missing and 287 people were injured in Japan. 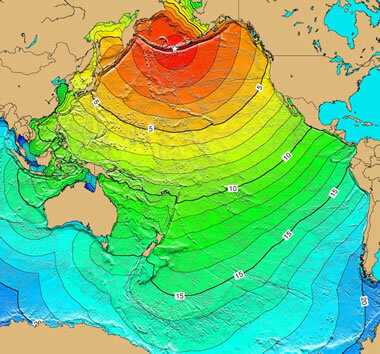 The tsunami was observed on tide gauges in Hawaii, the west coast of the United States, Alaska, Peru, the Marshall Islands, and Palau. NOAA image. View larger map. A catastrophic magnitude 8.1 Mw earthquake on December 20, 1946 on the south coast of Honshu, Japan was felt almost everywhere in the central and western parts of the country. The number of homes destroyed directly by the earthquake was 2,598; 1,443 people died. In addition, 1,451 homes were washed away by the ensuing tsunami waves. 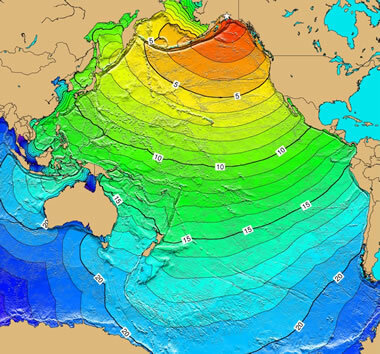 The tsunami was observed on tide gauges in California, Hawaii and Peru. (Reference #414) NOAA image. View larger map. 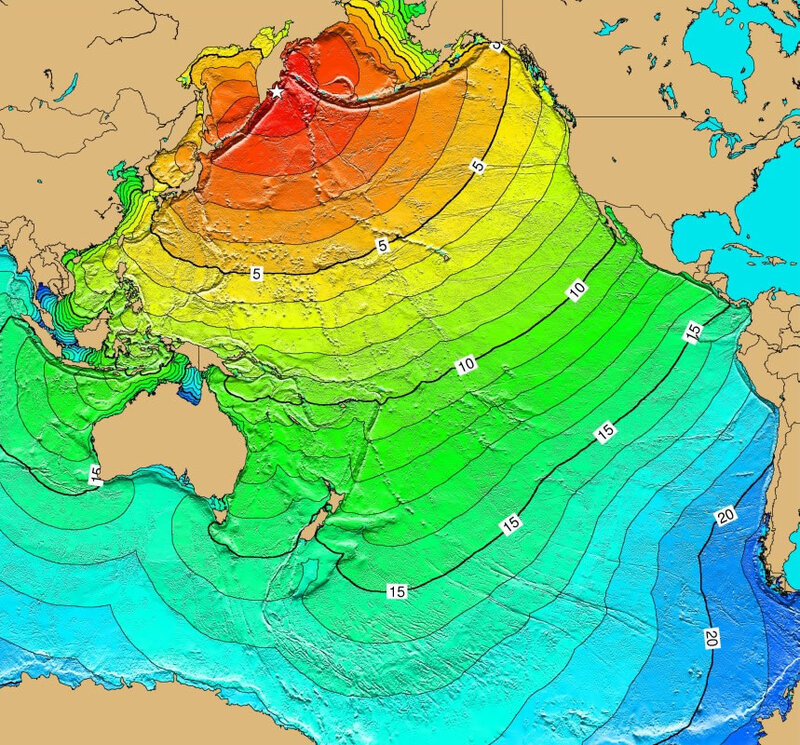 The magnitude 9.1 Mw earthquake on March 9, 1957	south of the Andreanof Islands, Aleutian Islands, generated a tsunami that did severe damage on Adak Island. However, the most damage (about $5 million) was done in the Hawaiian Islands. There were two indirect fatalities, a reporter and a pilot, and injury to a photographer when their small chartered plane crashed in the ocean near Oahu. NOAA image. View larger map. The magnitude 9.0 Mw earthquake on November 4, 1952 off the east coast of Kamchatka generated a 13-meter wave locally. The waves struck the Hawaiian Islands at 1:00 pm. Property damage from these waves in the Hawaiian Islands was estimated at $800,000 to $1,000,000; however, no lives were lost. It also caused damage on the west coast of the United States and was observed on tide gauges throughout the Pacific Basin. NOAA image. View larger map. 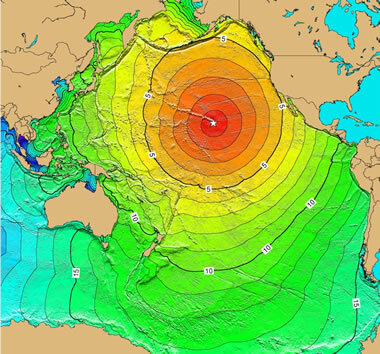 This magnitude 9.2 Mw earthquake and ensuing	tsunami caused 125 deaths and $311 million in property loss ($84 million and 106 deaths in Alaska). It was felt over a large area of Alaska and in parts of western Yukon Territory and British Columbia, its effects were heaviest in south central Alaska. The duration of the shock was estimated at 3 minutes. Vertical displacement occurred over 525,000 sq km. About 20 landslide tsunamis were generated; the tectonic tsunami devastated many towns along the Gulf of Alaska, left serious damage in British Columbia, Hawaii, and along the west coast of the U.S. (15 killed), and was recorded on tide gages in Cuba and Puerto Rico. NOAA image. View larger map. On May 22, 1960 a magnitude 9.5 Mw earthquake, the largest earthquake ever instrumentally recorded, occurred in southern Chile. The series of earthquakes that followed ravaged southern Chile and ruptured over a period of days a 1,000 km section of the fault. The number of fatalities associated with both the earthquake and tsunami has been estimated to be between 490 and 5,700. Reportedly there were 3,000 injured and intitially there were 717 missing in Chile. 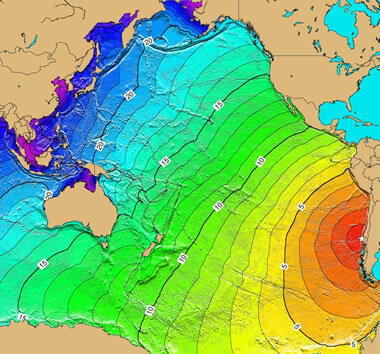 The main shock generated a tsunami that was not only destructive along the coast of Chile, but also caused numerous casualties and property damage in Hawaii and Japan, and was noticeable along shorelines throughout the Pacific Ocean area. NOAA image. View larger map. On November 29, 1975 a magnitude 7.2 Ms earthquake on the southern coast of the Island of Hawaii generated a locally damaging submarine landslide tsunami that was recorded at tide gauge stations in Alaska, California, Hawaii, Japan, Galapagos Islands, Peru, and Chile. 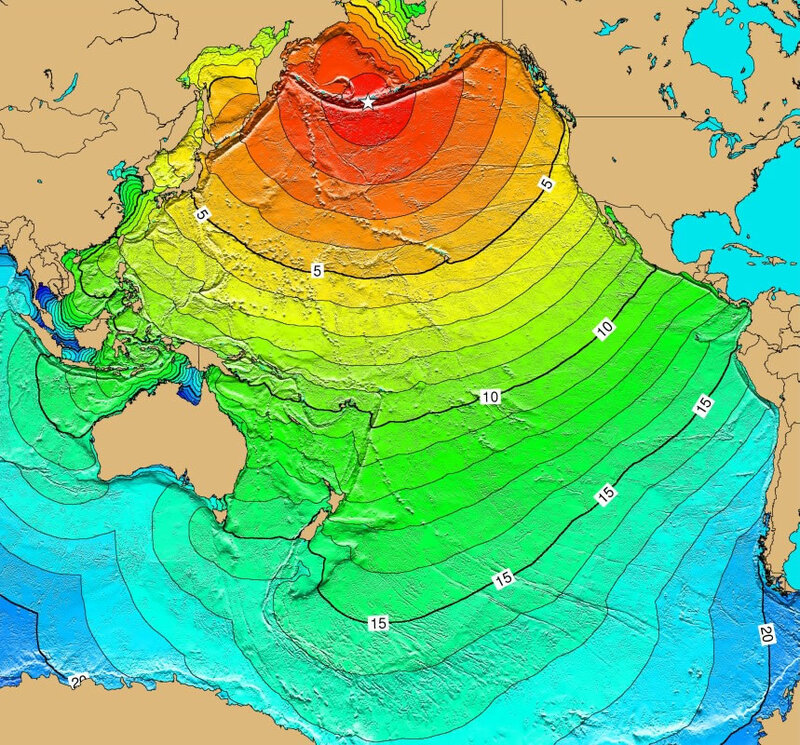 The tsunami caused $1.5 million damage in Hawaii, 2 deaths, and 19 injuries. NOAA image. View larger map. A magnitude 8.2 Mw earthquake on May 16, 1968 off the coast of Honshu Island caused destruction in Japan and generated a tsunami that was observed by tide gauges in Japan and throughout the Pacific Basin. As a result of the earthquake and tsunami, 52 people died and 329 people were injured; 676 homes were completely destroyed and 2,994 homes were partially destroyed; 13 homes burned down and 529 homes were flooded; 97 ships were washed away and 30 were sunk. In addition, roads, bridges and protective dikes were destroyed. NOAA image. View larger map.